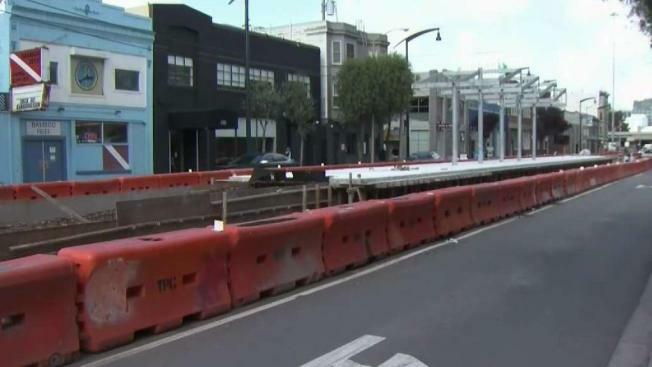 Delays are piling up for San Francisco's central subway construction, as a federal monitor says the billion-dollar project may not be ready until well into 2020. Meanwhile, the city's transportation authority says it’s committed to finishing the project this year. Clearly, not everyone’s on the same page when it comes to a completion date for the central subway, and the details matter because the construction, fencing and barriers have choked off parking and access to business, according to local merchants. One man says another delay could be the end of his coffee shop. "It hurt real bad. Real bad," said Steven Yam, owner of Latte Express. "We dropped like 40-50 percent, the business." The corner café sits right on the Fourth Street corridor, next to steel tracks and platforms that will one day make up the central subway extension. When that day will come depends on whom you ask. SFMTA spokesman Paul Rose says crews are aggressively working to complete it by an end-of-year deadline. "We’re absolutely committed to achieving this project by December 2019, as we said we would,"Rosa said. The project will link the T-third line in Mission Bay through the heart of SOMA to Chinatown. But a federal monitor has its doubts about new delays, noting a surge in legal claims between the city and its contractor, Tutor Perini. The federal monitor issued a warning in a report delivered this month: "If SMTA does not resolve the challenging relationship issues with its contractor, TPC, by first quarter of 2019, the start date may go beyond the current proposed extension date of May 26, 2020." The report also says "water leaks continue to be an issue" at the Yerba Buena Station, leading to excess moisture levels. "I don’t have the specific details on the specific leak at Yerba Buena, but at this point, we have our crews out there," Rose said. "They’ve addressed the situation, and I believe this was about 2-3 months ago." Riders and retailers say they’re hoping for the best but trying to be realistic. "I used to ride Muni," Terrance Vaughn said. "It used to be pretty convenient, and it used to be pretty reliable, and it used to be pretty fast. I don’t think that’s going to be the case anymore." The good news? Stockton Street by Union Square just reopened last month, after seven years of closures. Rose says the stations should be finished by July, meaning they'll be ready for testing, if work stays on schedule.